Welcome to KurdishLondon! This website aims to map Kurdish Community Organisations and anything else which is relevant to Kurdish people in London. It also includes additional information and resources on Kurdish communities in London. 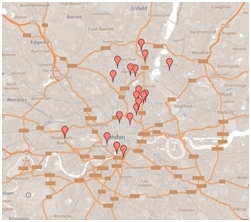 You can see the latest version of my map of ‘Kurdish London’ here. This is an experiment in participatory mapping, so you can contribute by adding information about places you know. 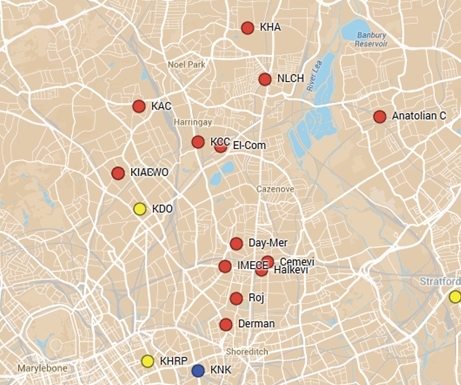 Here is a new update of the map of Kurdish community organisations. I have added a few more and introduced a visual classification, also plotting important organisations which are now closed. As usual, if you have any feedback on the map (did I forget anything important? Any inaccuracy you can spot?) please send me an email or contact me using the online form. To see the interactive map of Kurdish London click here. Dr İsmail Beşikçi will talk about the past, present and future parameters of Turkey Kurdish question and his struggle for academic freedom in Turkey. This seminar will be in Turkish with English translation. For further information and to book a place click here. It has been some time since I last update the Map of Kurdish Organisations on this website. I finally managed to find some time to re-do the whole thing from scratch using the new ‘Google Maps Engine’. From now on, this should allow me to manage and update the map more effectively. I am planning more updates over the next few days. In the meantime, if you have any feedback on the map (did I forget anything important? Any inaccuracy you can spot?) please send me an email or contact me using the online form. In this presentation, prof Neyzi will reflect on an international multidisciplinary project, “Young People Speak Out: The Contribution of Oral History to Facing the Past, Reconciliation and Democratization in Turkey” carried out in 2011-2013. Project output based on a large oral history archive include multimedia products such as a website in Kurdish, Turkish and English (www.gencleranlatiyor.org), exhibition, film and book. The presentation will focus on the research process, the participation of young people in the project, and reflect on the experience in light of the Gezi events and the current context in Turkey.